The first group of Indonesian water professionals to take part in the recent series of ICE WaRM Professional Development Programmes (PDP) has completed an intensive study course in Australia. The group of 21 spent almost four weeks in Australia studying leadership in water resources management. The 12 men and nine women included senior staff from tertiary institutions, national and provincial agencies and water authorities in Indonesia. The programme, which was majority funded under AusAID’s continuing Australian Leadership Awards Fellowships scheme (support funding included AusAID’s Indonesia Infrastructure Initiative), was based in Adelaide and incorporated intensive short courses, workshops and field visits focusing on building capabilities to manage water resources for an increasingly complex and uncertain future. 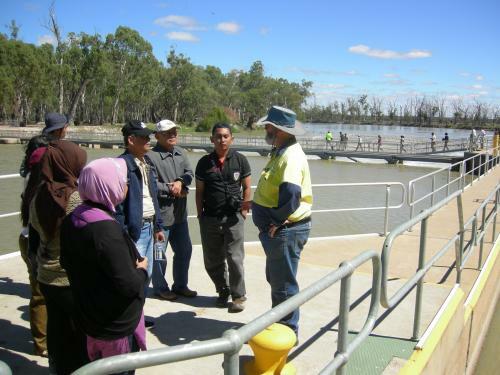 As well as the Adelaide-based studies, the Indonesian delegation visited regional South Australia – to assess the latest developments on the management of the Murray-Darling Basin – and Queensland. The visit was facilitated by ICE WaRM’s senior advisor in Indonesia, Risyana Sukarma, who was a key resource person for a substantial component of the programme. The Indonesian PDP follows recent ICE WaRM-hosted visits by high-ranking international delegations – including political and academic leaders from Brazil, China, Vietnam and Zimbabwe. Meantime, ICE WaRM’s senior adviser in the Mekong sub-region, Le Van Minh, took part in the World Water Forum, in Marseilles, France in his linked role as Chair of the Global Water Partnership – South East Asia.